Lights, Camera, Action (zzzz), Tweet! : It's All Politics There was plenty of media spin and punditry in Wednesday's debate, not just in Denver but on Twitter. The candidates appeared to be lacking in real zingers. Instead, it turns out the real conversation was happening through social media. Republican presidential nominee Mitt Romney and President Barack Obama shake hands at the first presidential debate at the University of Denver, Wednesday. I have spent the past few days sequestered with a crack team of political pros — actually, curled into a fetal ball, clutching a fading 1980 John Anderson poster — to gird myself for the vital first debate between President Obama and Mitt Romney. 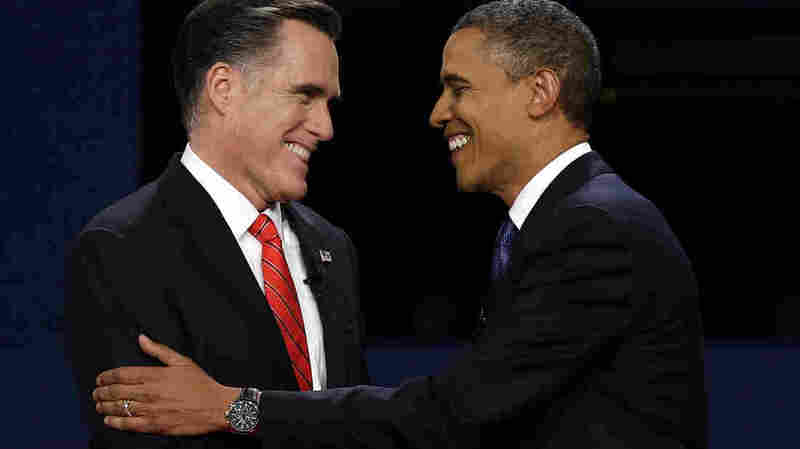 Would Romney offer to wager Obama $10,000 on who wins the race? Would Obama tell Romney, "You're taxable enough, Mitt"? Would the two men reveal the secret handshake taught only to graduates of both Harvard College and Harvard Law School? (Didn't remember Romney had the J.D. as well as the MBA, did you?) Would they be able to toss zingers with tight spirals in the thin air of Denver? Would the competing journalistic fact checking units break into open warfare before the end of the actual debate? 2. Romney apparently believes the word "question" is a synonym for the word "rebuttal." PBS's Jim Lehrer: "But first, Gov. Romney, do you have a question that you'd like to ask the president directly about something he just said?" Romney: "Well, sure. I'd like to clear up the record and go through it piece by piece. First of all, I don't have a $5 trillion tax cut." My punctuation may fail me, but that doesn't sound like there was a question mark in there. 3. This was the "prevent defense" debate. Neither man made a glaring mistake, but neither could have stirred much of a pulse even in a Red Bull addict. Obama seemed particularly flat. Was he aware they were actually on TV? And, as a result, Romney's fans will be galvanized by this relatively sedate debate, because he did perfectly fine. 4. Romney announced he would cut Obamacare and Big Bird — along with declaring, "I love Big Bird." No word on the governor's stance on Cookie Monster. Obama's just not used to being challenged anymore. Should have hired Bibi Netanyahu to play Romney in debate prep. 6. The stakes were high, the lights hot. Early on, Romney was visibly perspiring. Not a Nixon-like precipitation, but a well-planned ploy to prove that he's not Data from Star Trek: The Next Generation. That, or the programmers made adjustments to the operating system. 7. Obama was shamelessly willing to get in the gutter and match his opponent, one droning, statistic-laden-argument-over-arcane-policy-distinction after another. 8. The NFL should have hired Romney as a replacement referee — the man wanted to moderate his own debate, repeatedly talking over the genial Lehrer: "I think I get the last word." Those who do get the last word — OK, the next-to-last-word before the voters — debated among themselves how to go through this ritual once more. I'm talking the journalists, analysts, pundits and prognosticators. New York University journalism professor Jay Rosen mocked the professional flock for just showing up to Denver. Almost all journalists at the debate tonight will have to watch it on TV in the media space. Q. Why are they there, then? A. The spin room. Purity! Stay out of the spin room! Hear the people online! All the major news outlets built up their online presences based in large part on social platforms. ABC's joint site with Yahoo (going full tilt in the absence of any TV presence before the 9 pm ET start ) — sorted through the tweet-per-minute ratios; CNN tweeters tracked how well independent voters with little instant opinion knobs liked the two candidates. Social media is the future of the media! "I think with Twitter, and the way information now moves, the sense of how the debate is being played out occurs in almost real time," Romney spokesman Brian Jones told The Huffington Post's Michael Calderone. "In years past, you may have had to wait until the debate concluded." So wait — the empowering, democratizing, level playing field of social media is also spintastic? In other words, the one place you don't want to talk politics is Twitter. A fact that he was most directly able to communicate to 3,047 followers via the direct information IV drip that rhymes with "litter."